Our garage was a disaster. And the space was so poorly used that every time we went in there I felt overwhelmed. It took a lot of work, but with the help of The Home Depot, we tamed that beast! 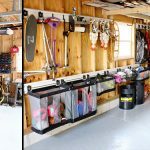 You can find all of the before and after pictures and everything we used to get there by visiting their blog, but I also wanted to share with you our 8 garage organizing tips we used to get there. No stone can be left unturned. Every cabinet needs to be emptied out, every bin needs to sorted through and everything needs to be pulled out. 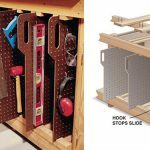 You need to really know what you have and what you don’t before you can really make any headway in organizing a garage space. Really decide what needs to say and what needs to go. I am big believer in getting rid of what you really don’t love or need so that you can find and access the things that you do. We had bins and bins and bins of Halloween decor that we didn’t use any more. Having a Halloween baby will do that to you. Almost all of it is gone and that means three less bins to store. Each purge makes a difference. Our goal was to throw away as little as possible. We had a huge garage sale which also funded some of the project. We gave away as much as possible. I even had a friend come by after our yard sale and wait as I put together gift baskets filled with stuff that didn’t sell to use for a future raffle at church. Then, we brought some stuff to an auction house and a bunch to The Salvation Army. In the end, more than we would have liked went to the dump, but we did what needed to be done. We were just piling things up here and there and then it was too difficult to get to what we needed. We used the ceiling for storing some lumber and some carpeting. Shelves were added to be able to stack things while still keeping them accessible. We used peg board, organization systems, shelves and cabinets in combination to maximize our space as much as possible. The walls became our most useful space. 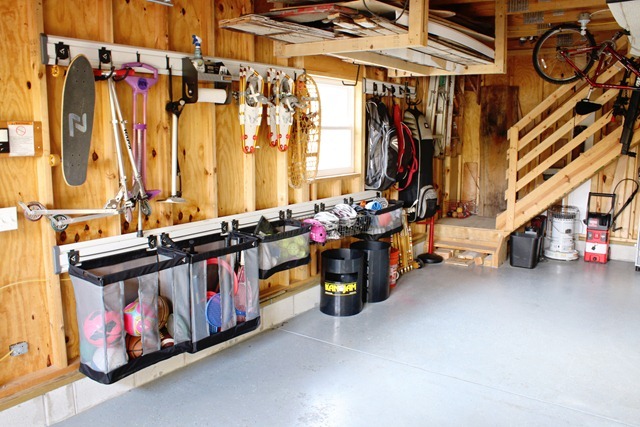 One of the most important parts of organizing your garage is setting up a system to keep it that way. We set out to make as many things as visible as possible. 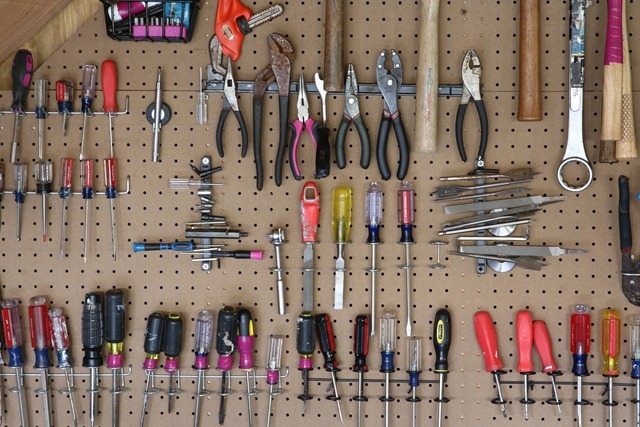 All of our hand tools are out on the pegboard, not buried in four different tool boxes. 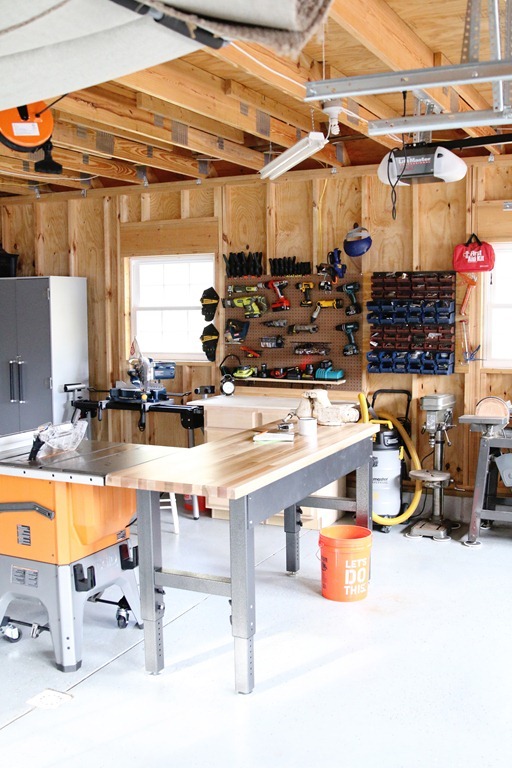 We also created a whole zone for our small power tools and chargers. Our hardware was all over the place, now it is group in individual small bins where we can easily find and reach what we need. 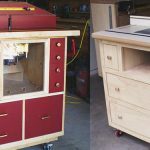 By keeping so much visible we do not have dig through drawers and bins to find what we need, which eliminates mess. We also save time by quickly finding what we need and we always know what we already have. And, when we are done it is so easy to put it away. When we did our initial purge, our next step was to group everything by categories. We ended up with sport goods, hand tools, small power tools, garden and paint as our main groups. Then, we spent a fair amount of time really thinking through how we use the space and the best place to put things. The left side of the garage still needs to park a car, so we knew we had limited depth there, but it was the perfect place to hang all of our sporting goods. By thinking through how we wanted to use the space, we are hoping to it will be easier for us to keep it this way. Once we had everything split up in the major zones, we broke it down even further. For example, all screw drivers are together, all biking equipment is together, etc. The same principles apply – make it easier to find what you need or easier to put away. 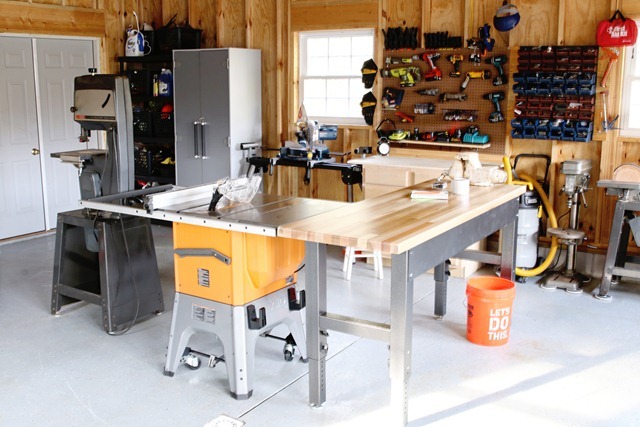 We use this space as a workshop as well as storage space so clean up is an important consideration. 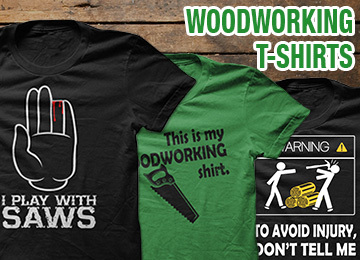 All of our woodworking equipment used to be in another space and we constantly battle sawdust. Now, we have a powerful shop vac in place, on casters, that can easily clean up sawdust along with dirt and dust. We also keep paper towels, spray cleaner and garbage bags all within reach. Using the same principles as you do inside your home for cleaning up will make it much easier. 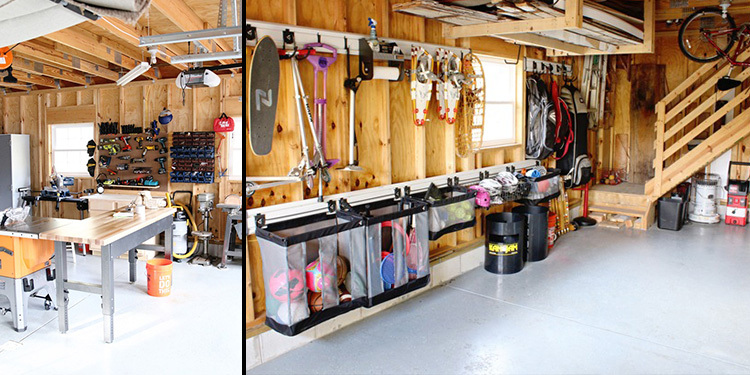 The key to the success of a garage organizing project is to keep it that way. We have been down this road before and sometimes, things get busy and then you lose control. It is even more challenging for us now because we are constantly having things shipped to the house for our maple syrup business that end up piled up in here. Even if we don’t get to it that day, we need to get back out there and get it in check. When we finish a project, we clean it up. And, if we can’t get it to that day – head back out. I kind of look at it like dishes in the sink. Sometimes, they pile up and you have to let them be, but you always come back. The key is to always go back and clean the dishes in the garage! 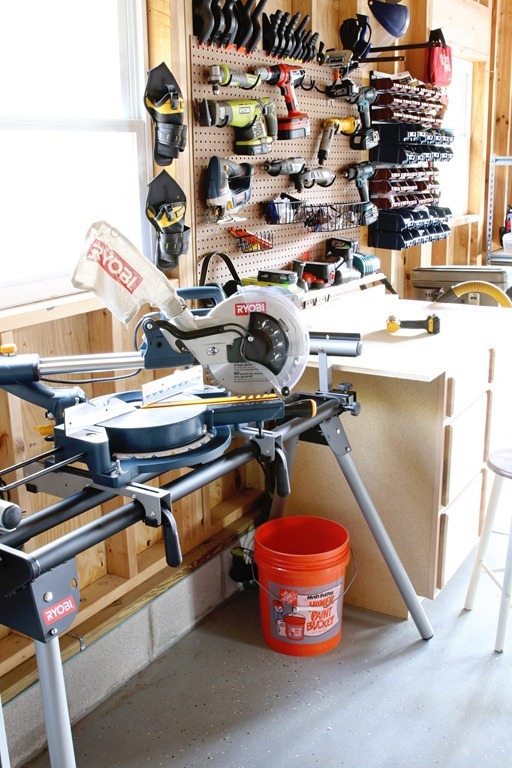 So how about you, are you ready to tackle a garage space? We did this over several weeks since it was such a big undertaking. Make sure you have enough time when you take on your space that you can do it well and still manage all the other needs of your household.